Linton ‘The Swarm’ Vassell is excited to return to heavyweight, and for the possibility of a rematch with Ryan Bader. However, a protege of Fedor Emelianenko awaits at Bellator 218. England’s Linton Vassell is back in the Bellator MMA cage this weekend. At Bellator 218 in Thackerville, OK, he’s part of the co-main event, another big fight in a career full of them. Vassell has twice fought for light heavyweight gold in Bellator. He took part in the promotion’s one-night light heavyweight grand prix. Now, he’s moving to heavyweight for the first time in nearly a decade. It’s a decision he’d been mulling over a while, he told Cageside Press recently. What triggered it was “pretty much my last fight. Fight camp. It’s as simple as that. It got harder and harder. Not drastically, but bit by bit.” That would be the weight cut down to light heavyweight. Coming off two losses (to champ Ryan Bader and former champ Phil Davis), it was “the perfect time, to start again. Start at heavyweight, my natural weight.” He was cutting down from over 100 kilos (a bit north of 220lbs) his last fight camp, and afterward, he made the decision to switch. After having fought at heavyweight earlier in his career, it’s a homecoming of sorts. It’s not just dipping his toe in the pool, either. Linton Vassell intends to stay at heavyweight from this point forward. And he’s arriving in his new home with a familiar face atop the mountain: Ryan Bader, who holds both light heavyweight and heavyweight gold in Bellator. 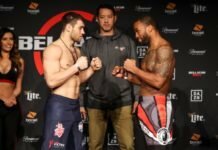 Valentin Moldovsky, Vassell’s opponent, is a student of the legendary Fedor Emelianenko, a finalist in the Bellator World Heavyweight Grand Prix. That’s another reason for excitement for Linton Vassell. It will have been nearly ten months since Vassell stepped in the cage come Bellator 218, and it wasn’t the change of divisions that held him back. Instead, just plain matchmaking issues. “They booked me a fight for the Hawaii card, but for some reason they took me out and put Frank Mir in.” That was the bout against Javy Ayala, that Mir would go on to lose. That he is. Bellator 218 airs Friday, March 22, live on Paramount Network and DAZN.